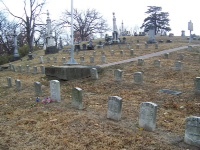 A few months ago, I wrote about Evergreen Cemetery in Southgate Kentucky needing assistance to raise funds for various maintenance issues, especially its roads. Here is a press release for an event the Friends of Evergreen will be hosting in early April. Evergreen does have a section for Union Soldiers, which includes Medal of Honor recipient William Horsfall. Several other Union veterans are buried throughout the cemetery as are a few ex-Confederates. 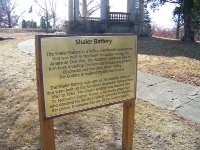 It also includes the location of Battery Shaler, a Union defensive position during the Civil War. Background information on the Friends of Evergreen Cemetery: The Friends of Evergreen Cemetery seek to preserve, protect and restore the cemetery for past, present and future generations. The Friends intend to carry out this mission through historic research, public education, fund-raising and various preservation projects. As Friends of Evergreen Cemetery, we hope to pass on to future generations the historic landscape and enduring beauty of this most treasured space of tranquil rest. Here are some of my photos of the Civil War-related areas of Evergreen. 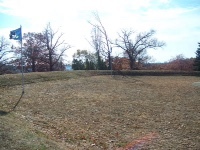 2 of the rebuilt walls of the battery sight.